The entire episode took place in the 13th over of the match bowled by Umesh Yadav. Indore: It was a clinical performance from Royal Challengers Bangalore, who put up splendid performance on field to trash Kings XI Punjab by 10 wickets and keep their play-off chances alive. While bowlers leaked runs in the earlier matches, yesterday's encounter saw them producing good performance to bundle out KXIP for mere 88 runs. Aprt from bowlers, RCB skipper Virat Kohli too was involved in action, when he got in arguement with umpire. 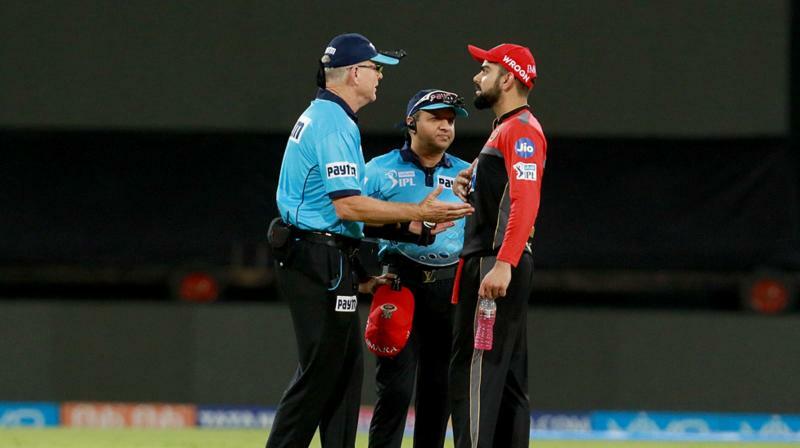 Kings XI Punjab all-rounder Andrew Tye who had taken the DRS after being given out withdrew his appeal after a few seconds which led to RCB skipper Virat Kohli fuming over the umpires. The entire episode took place in the 13th over of the match bowled by Umesh Yadav. The bowler bowled a short delivery , which Tye missed while playing to hoick the ball. The delivery took an edge it to the wicketkeeper Parthiv Patel who took the catch easily. The umpire also raised his finger inspite of Tye signaling for the DRS by challenging the decision. But later on, he held a discussion with his partner Axar Patel and withdrew his appeal. While the ultra-edge also picked up clear deflection, Kohli was not at all happy with the decision of the umpires. Inspite of trying to seek more clearance on the incident, the on-field officials told him to get on with the game.